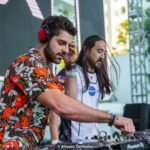 An aggressive in your face take on Aoki & Samson’s Wake Up Call by Dim-Mak label mates, Mustard Pimp. This massive remix only furthers my desire to have No Beef and Turbulence released already! What’s the hold up?